Born in 1945, the United Nations came to life in the Arab world. It was there that the UN dealt with early diplomatic challenges that helped shape its institutions such as peacekeeping and political mediation. It was also there that the UN found itself trapped in, and sometimes part of, confounding geopolitical tensions in key international conflicts in the Cold War and post–Cold War periods, such as hostilities between Palestine and Iraq and between Libya and Syria. Much has changed over the past seven decades, but what has not changed is the central role played by the UN. This book’s claim is that the UN is a constant site of struggle in the Arab world and equally that the Arab world serves as a location for the UN to define itself against the shifting politics of its age. Looking at the UN from the standpoint of the Arab world, this volume collects some of the finest scholars and practitioners writing about the potential and the problems of a UN that is framed by both the promises of its Charter and the contradictions of its member states. This is a landmark book—a close and informed study of the UN in the region that taught the organization how to do its many jobs. Karim Makdisi is Associate Professor of International Politics at the American University of Beirut and Research Director of the UN in the Arab World program at the Issam Fares Institute for Public Policy and International Affairs. Vijay Prashad is Professor of International Studies at Trinity College and Senior Non-Resident Fellow at the Issam Fares Institute for Public Policy and International Affairs at the American University of Beirut. 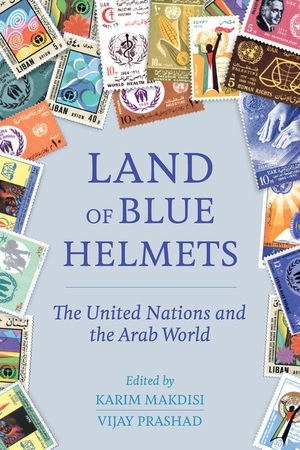 "Karim Makdisi and Vijay Prashad’s Land of Blue Helmets: The United Nations and the Arab World therefore offers not only an important scholarly contribution but also one of some political urgency for anyone who seeks to gain a better understanding of the past, and probable future, work of the UN."